Oh $hit, I am forty years old! that sounds so old to me right now but for some reason I don’t feel that old. Maybe because I am traveling around the world and truly enjoying my life right now. I do ask myself from time to time if I am too old to be doing all of this… I rented my apartment in LA, sold my car and quit my job; which can be a bit scary at this point in my life. As I explained in my first post I wanted to do long-term travel for the past ten years but for a million reasons I waited to do it until now. In a way, I don’t regret having waited this long, in a way. I feel like I am more prepared for all of the experiences that I am going through and to accept all of the challenges that have come along the way. I am more mature, more self-confident and more open to learning different things…more than I ever was in my twenties! I had originally thought about celebrating this milestone birthday in Thailand and having a big party with family and friends, whoever could join me. At the end I decided not to go there because of the rainy weather in August and instead came to the Middle East and asked my mom and stepdad to join me. We chose ISRAEL and what a special place to celebrate this important time in my life, and even better… with the person that gave me life! My mom and stepdad offered to cover all of my expenses while in Israel as a birthday gift; which gave my pocket a nice break since this country can be expensive. I had such a great time with them! I will never forget this birthday and the experiences that we lived together in this beautiful and interesting country. Thank you MOM and Alberto! I spent the rest of the week in Tel Aviv with Airbnb hosts Yonatan and Mor in the suburb of Givatayim. They also love to travel and host people from around the world. They were super nice and hospitable and very easy to be with. They gave me some tips for my upcoming travels to India. They were hosting another couple, Gillian a very nice a lady and her son from South Africa. I enjoyed getting to know Tel Aviv with all of them and in general learning about the Israeli culture and the Israel-Palestinian conflict from their different perspectives. Neve Tzedek, the first Jewish neighborhood to be built outside the old city in the ancient port of Jaffa. Tel Aviv has really great beaches! 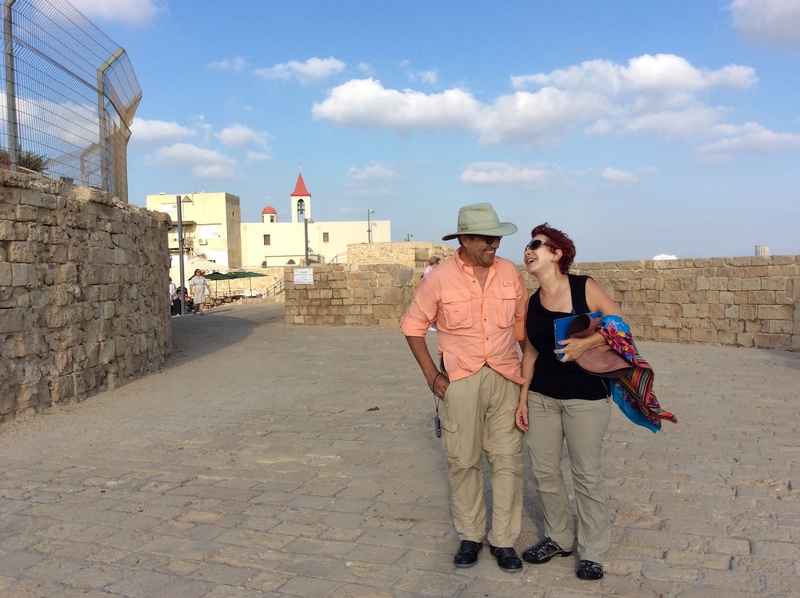 Visiting the ancient Jaffa port city. Enjoying the views and great hummus from Casita restaurant by the old city. Gil introduced me to the delicious Sabich, yum! At Gan Haatsmaut celebrating my birthday with hosts Yonatan and Mor, Mor’s sister and fiancee and their friend. If couch-surfing doesn’t provide a good host, at least it provides fun events… I joined a group to tour around the old city of Jaffa where I met Roee, a really nice Israeli guy and Franziska from Germany among others. 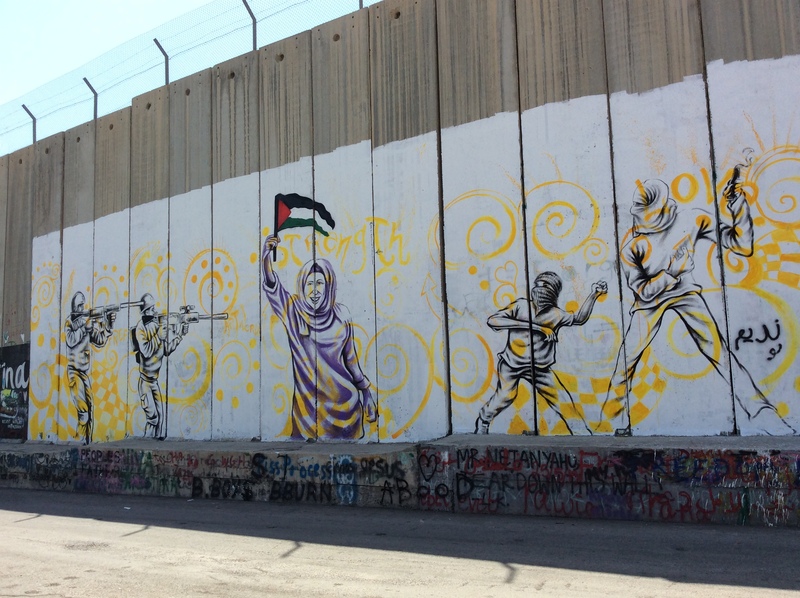 After the event Roee and I walked around the city visiting the street art fair in Nahalat Binyamin, Carmel market, and the German Templer of Sarona, one of the first modern agricultural settlements in Palestine. We spent the entire day together and I learned a lot about his views on Israel’s past and current issues. Yet another fortunate opportunity to learn from a local person about their own country. What a great day! I met Franziska again the following day to enjoy a nice sunset swim at Gordon Beach and yet another delicious Sabich! This is a delicious pita stuffed with eggplant cooked to perfection, smashed hard boiled eggs, hummus, spices and veggies. Pure goodness! Eating Sabich (again) with Franziska and her friend. Observing religious traditions in Carmel… This guy is putting on the Tefillin, a set of small black leather boxes filled with scrolls of verses from the Torah, worn by devout Jews during weekday morning prayers. 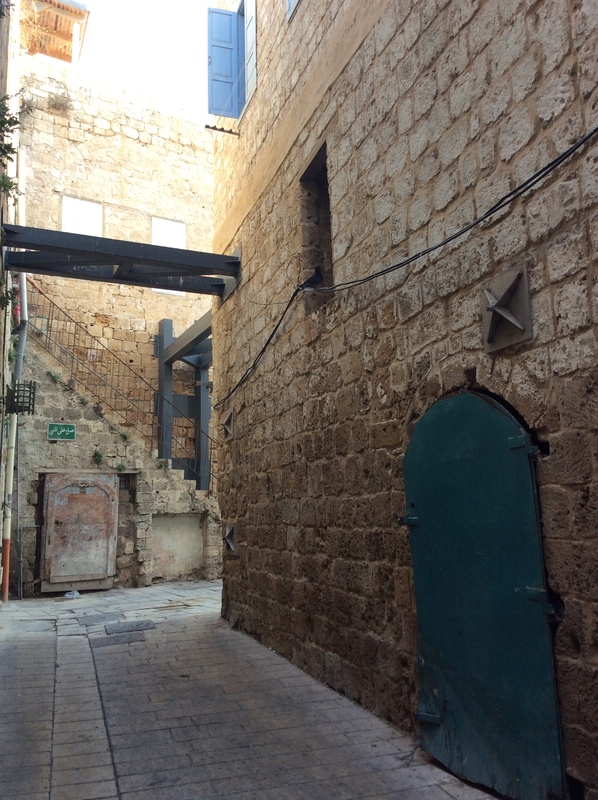 Couch-surfing tour of the old city. Oren, the guide, and his friend explaining life in Jaffa. My new Israeli friend Roee. 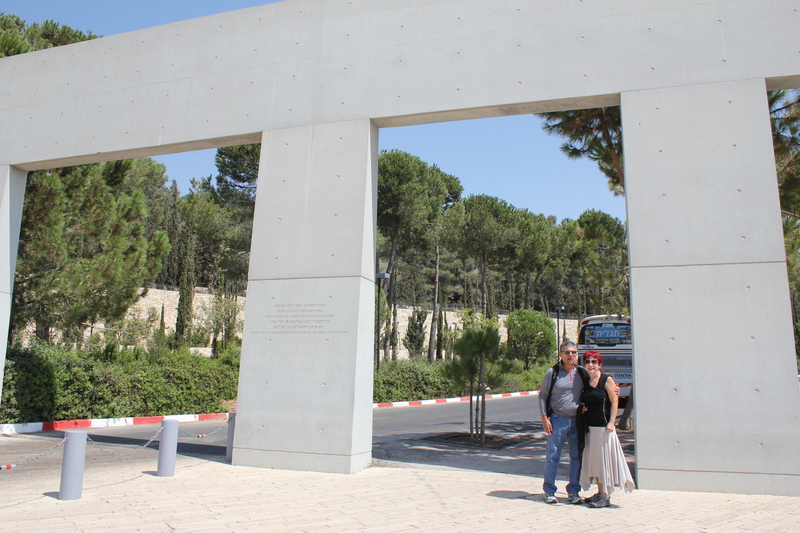 I packed my bags and said goodbye to Yonatan and Mor (thank you again to the most wonderful hosts!) and met mom and Alberto at the airport to travel to Jerusalem together. It was so great to see family after four months of travel. They looked great and eager to share some adventures together to celebrate my 40th birthday! We stayed in the Arab part of the city in a nice mid-range hotel on a street full of “character”. 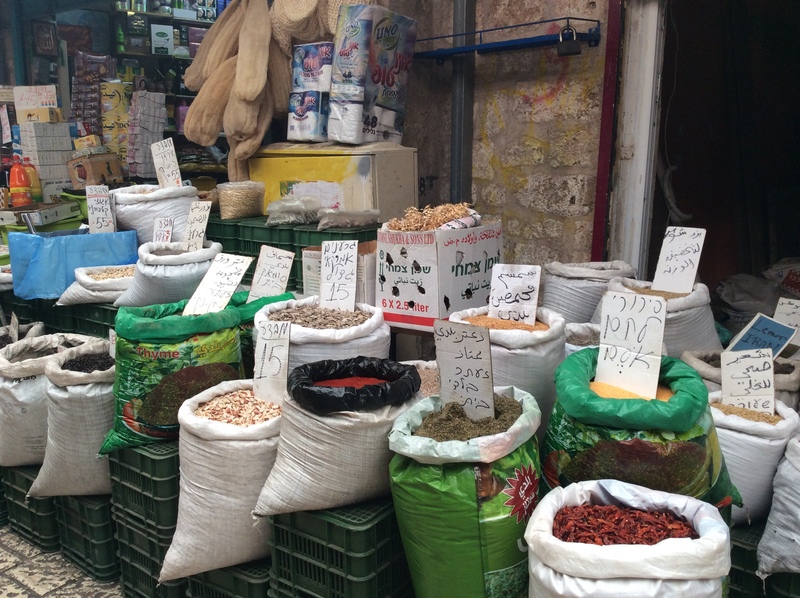 Let’s just say mom learned to open up a bit more to a world very different than hers 😉 That same day we decided to take it easy and just enjoy a stroll around the Russian compound area in the new city and the Mamilla shopping area. And for my actual birthday we headed to the walled old city and visited all of the well known and important landmarks of this holy land. 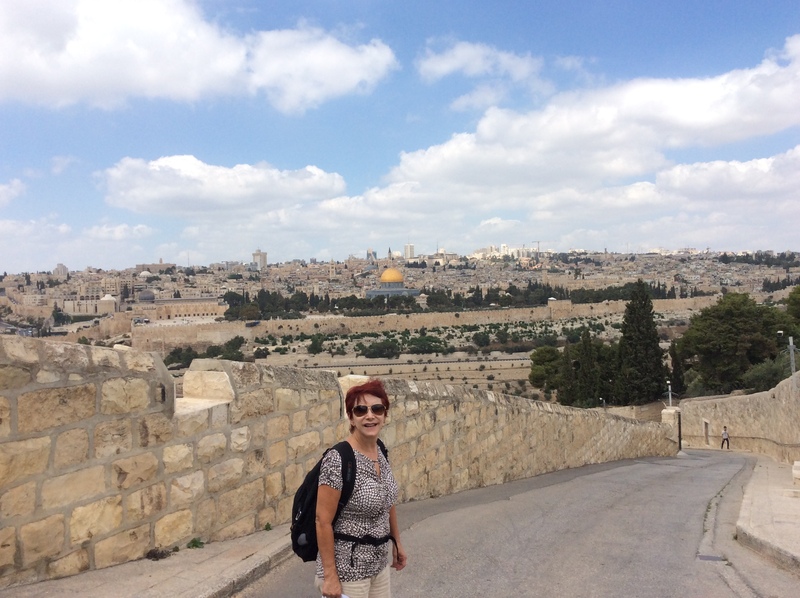 We walked around the Christian and Muslim Quarters, visited the Western wall (aka wailing wall) where we left our wishes written on a piece of paper, the Temple Mount where the Islamic Sanctuary known as Al-Haram al-Sharif is located; made of the Al-Aqsa Mosque and the beautiful golden Dome of the Rock. 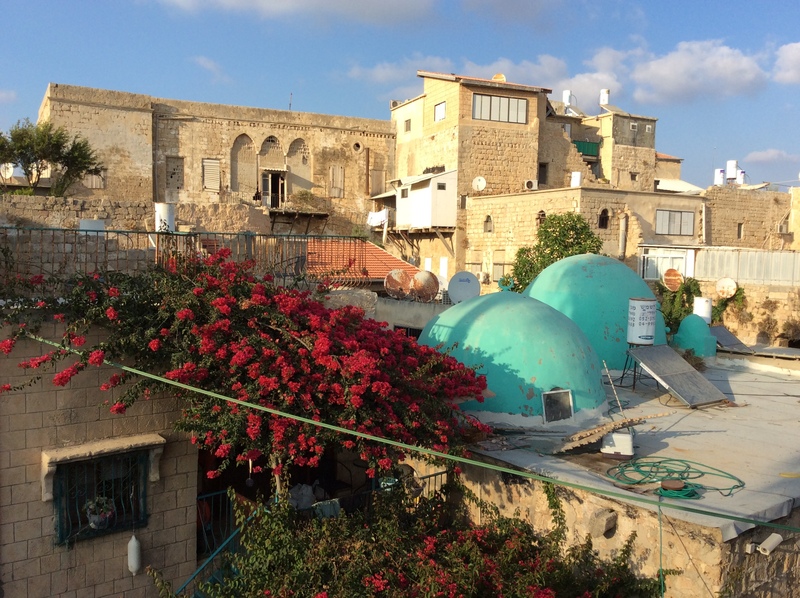 The Dome currently stands over the rock; which is of major religious significance to Muslims, Jews and Christians. To Muslims, this is the spot from where Islamic prophet Muhammad prayed and ascended into heaven accompanied by the angel Gabriel. 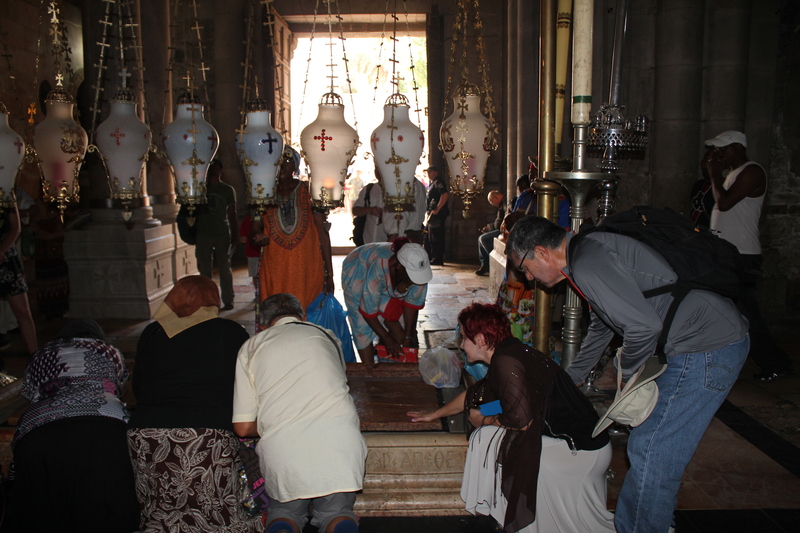 To Jews and Christians, the stone is the site where Abraham prepared to sacrifice his son Isaac for God. And this is where King Salomon built the First Temple said to house the Ark of the Covenant. 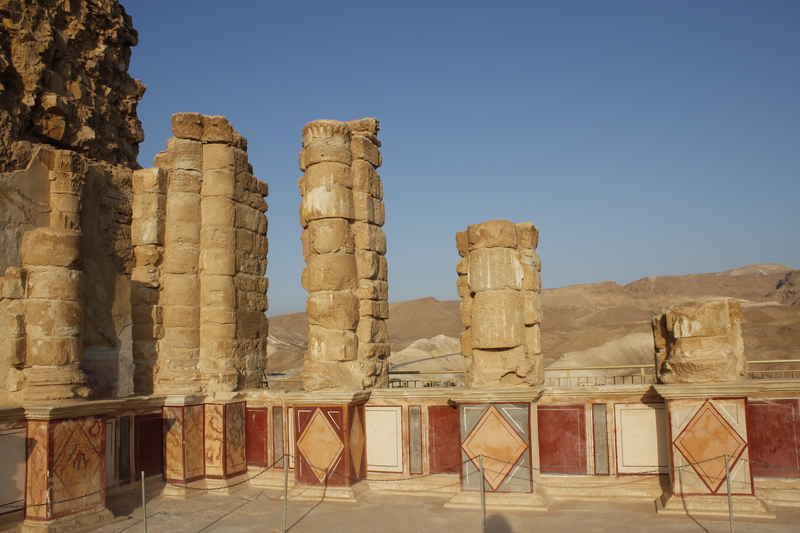 The Great Herod built the Second Temple on this same site where Jesus is said to have worshipped. The Dome is the third most important shrine for Islam after Mecca and Medina. Non-muslims are not allowed to enter the Dome and entry to the surrounding area is restricted and limited to certain times during the day. 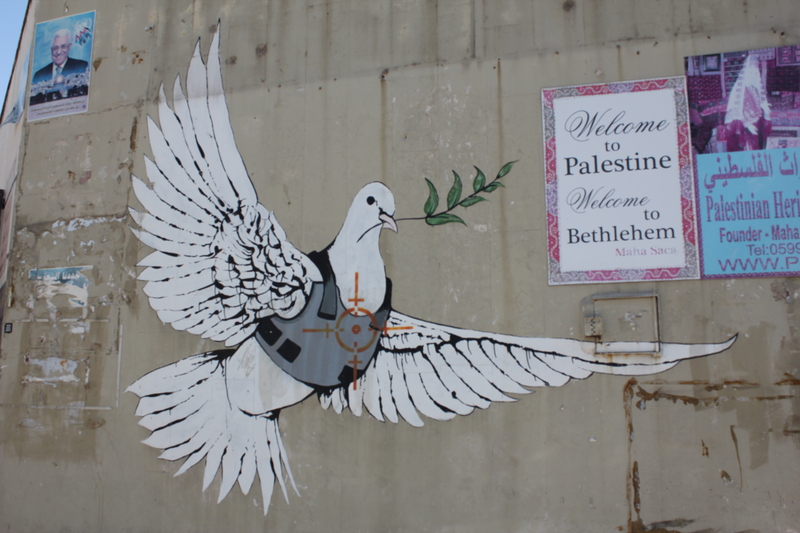 As many of you know, it is a place of high tension and highly contested religious site over which both the Palestinian Authority and Israel claim sovereignty. We actually witnessed a group of Israeli soldiers walking on the grounds near the mosque and two Muslim ladies screaming at them and holding copies of the Quran to their faces. It was a very beautiful and interesting place to say the least. 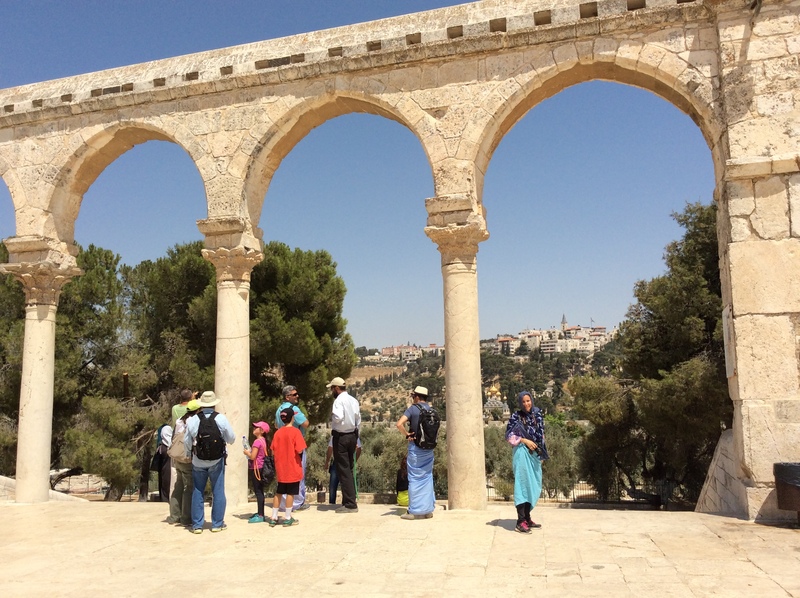 We also joined a guided tour of the western wall tunnels; which reveal the amazing history and geography of the Temple Mount where you can see the original grounds of this old city. It was like doing some time travel as we learned the history of this old and magnificent city. 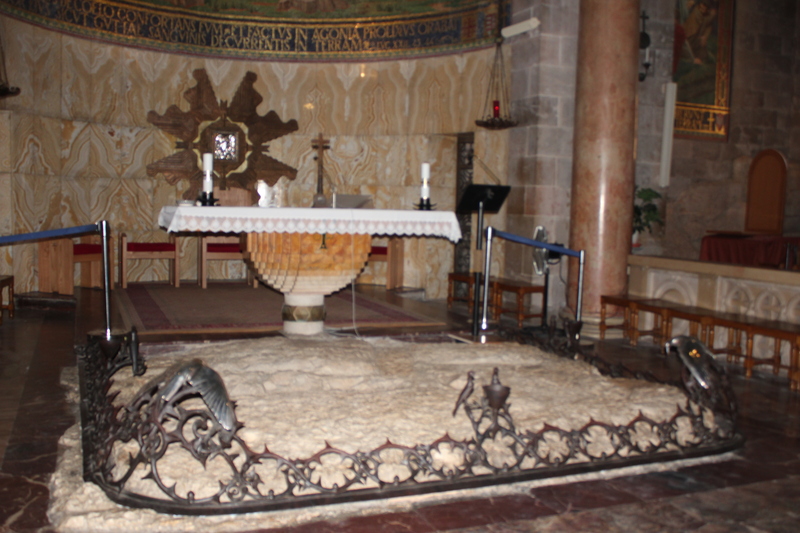 And as good Catholics we visited all of the important Christian sites where Jesus was held prisoner, the flagellation church, the stations of the cross and where Jesus was condemned to the cruxifiction. 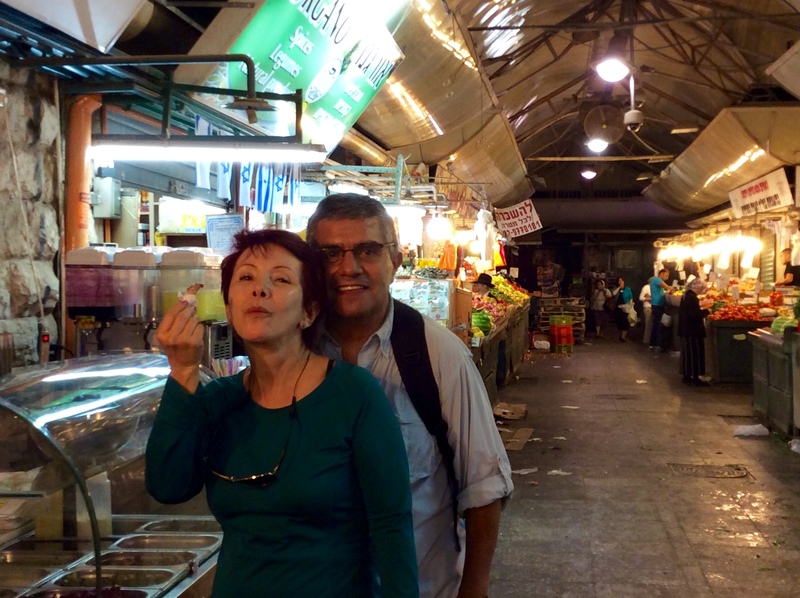 At night we celebrated the rest of my birthday with amazing food and drinks in Mahane Yehuda and later visited the market for some gelato. Happy birthday to me! heavy security checks to enter the old City. 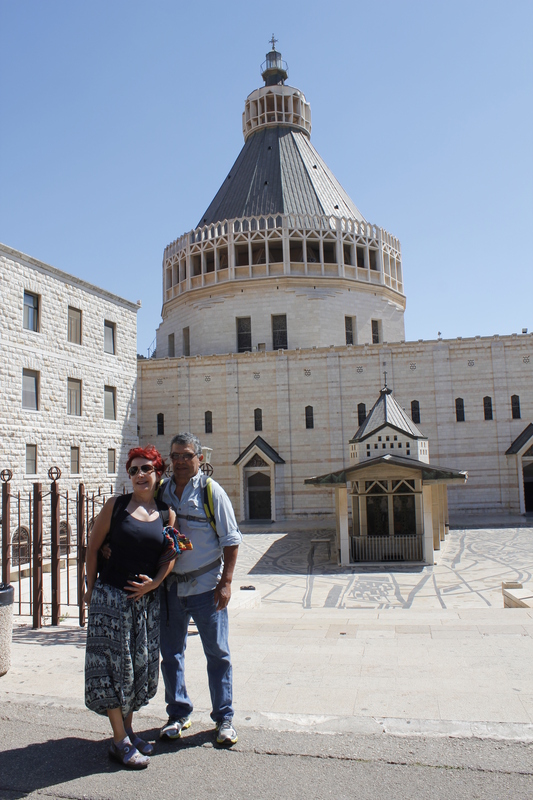 We took a bus to Bethlehem in the West Bank to see the grotto where Jesus was born, the Church of the Nativity and St Katherine where midnight mass is held every year. We were invited by Sammy, a very nice Muslim Arab local to have some tea at his place. The best tea we had on our trip with ginger, coriander, sage, peppermint, thyme, cinnamon, and lemon. Mom spotted what looked to be a Starbucks (turned out to be fake) where we had lemonade and ice-cream and were offered a special tour to see the Separation Wall. 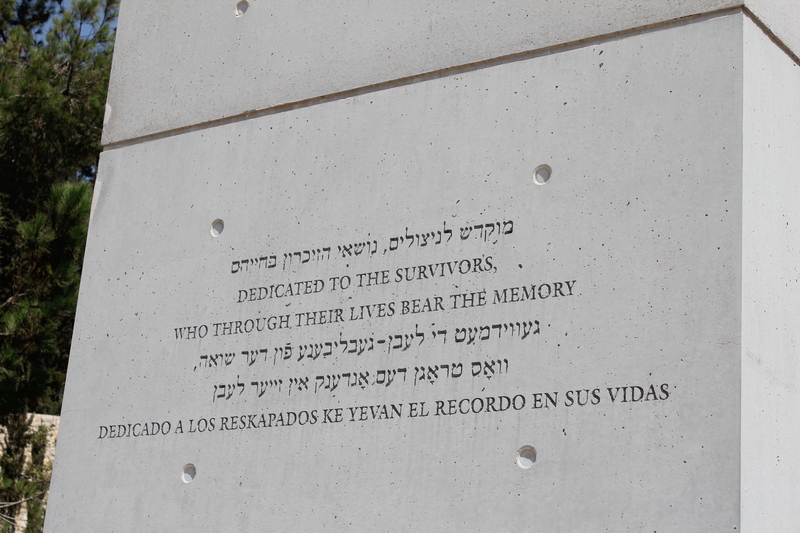 We were a bit suspicious and reluctant to just get into anyone’s car, especially to go see the wall. We were not sure if it would be safe so we decided to walk around town some more and ran into another guy that offered the same tour for less and decided to finally accept. When else would we have this opportunity to see part of the recent history of this side of the world. 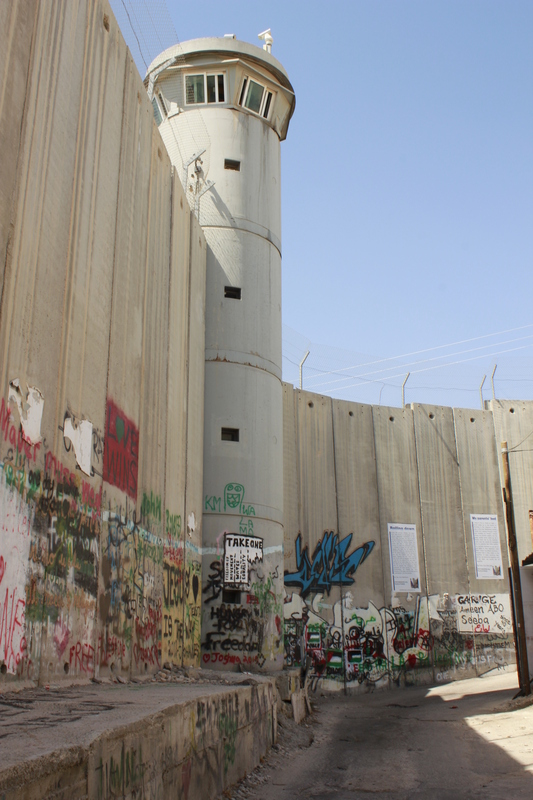 We visited the wall; which was full of graffiti depicting the cruel reality of what this construction signifies, some of it by the famous Banksy. We were dropped off right before the border check point to go back into Israel. Alberto gets a bit nervous crossing borders and sure enough the metal detectors kept going off every time he tried to go through them. The poor guy was sweating bullets and he thought he would be stuck in Palestinian territory for a while. 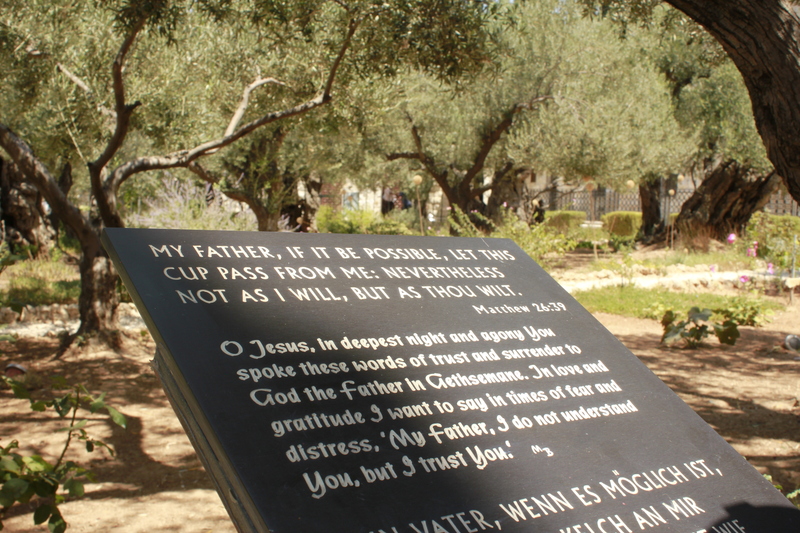 We visited Gethsemane gardens, where Jesus prayed and the Disciples slept the night before his crucifixion. 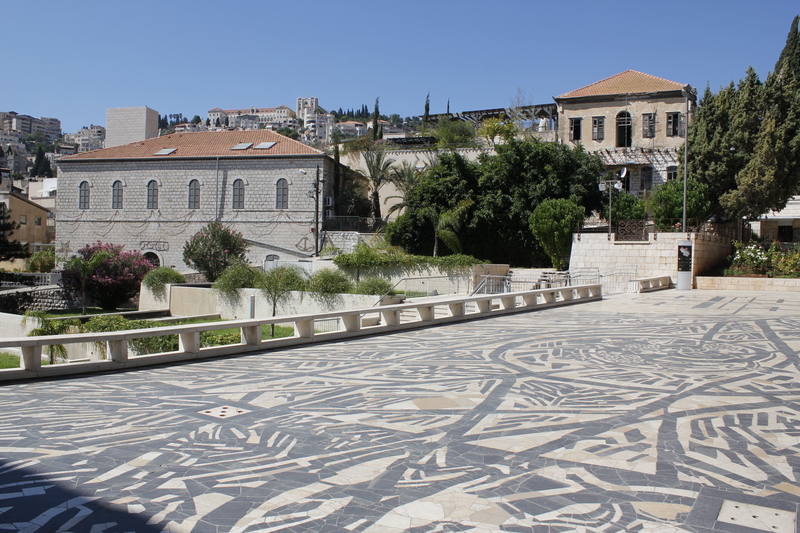 Here are pictures of the garden and the Church of all Nations located at the base of the Mount of Olives. 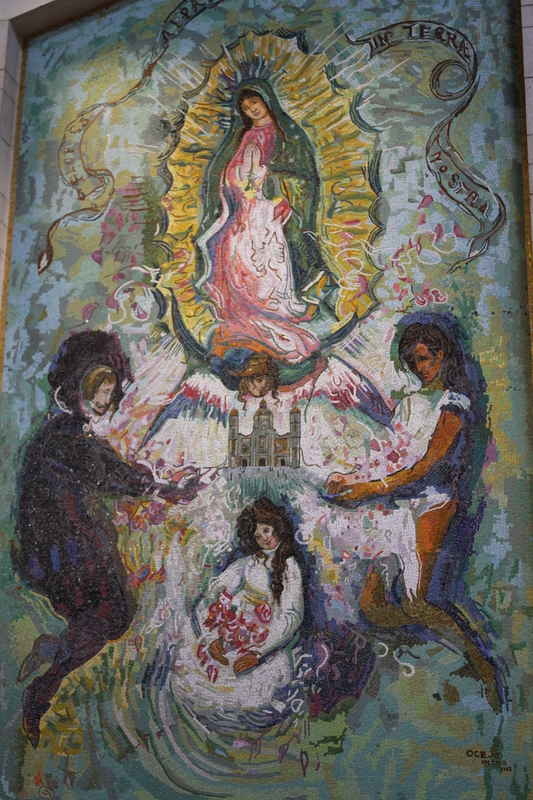 This is also said to be the place where the Virgin was buried. 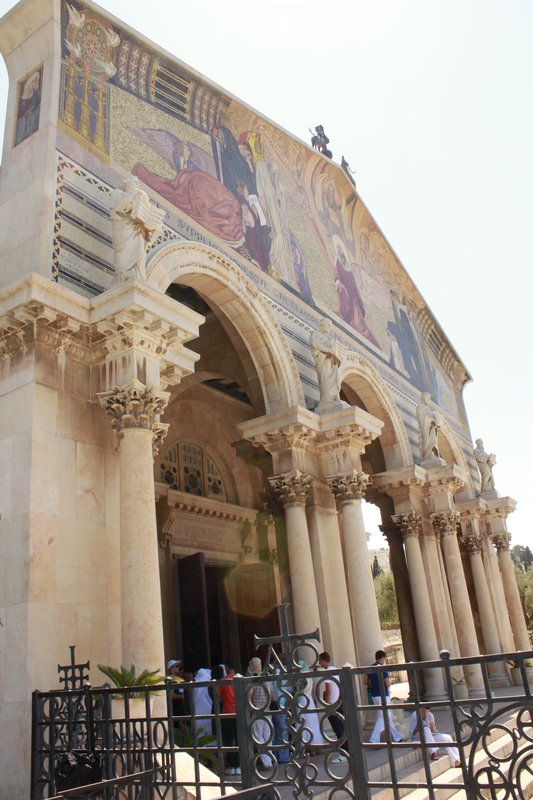 After our usual ice-cream or gelato stop, we made the strenuous journey up to the top of the Mount of Olives to visit the Chapel of the Ascension, where Jesus ascended into heaven. We met Wally, a very nice and knowledgeable man who shared a lot of the Bible history with us. He also offered to take us back to Palestinian Territory in the West Bank to see Jericho, Bethany and the Judean dessert. He is a Christian Arab Israeli who is allowed to cross the border easily so we had no problems getting through. 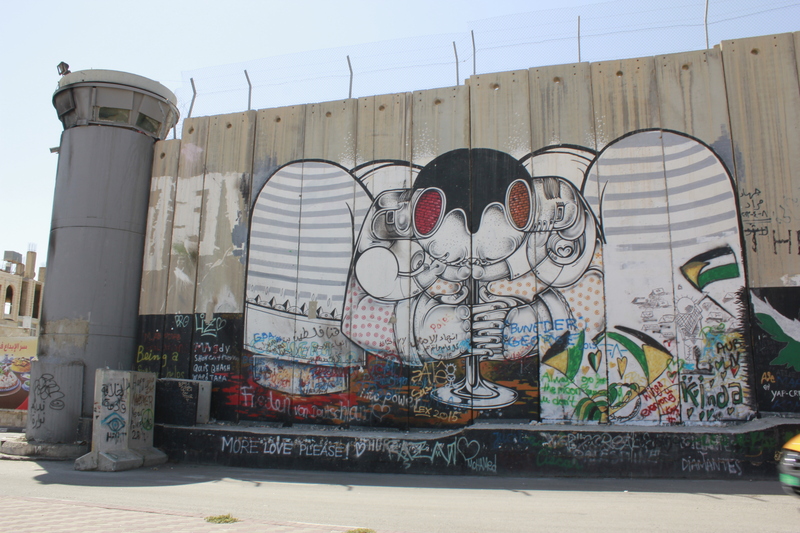 He also offered his views on the Separation wall as being good because the killing has stopped but bad because a lot of good/innocent people have been separated from family and friends. 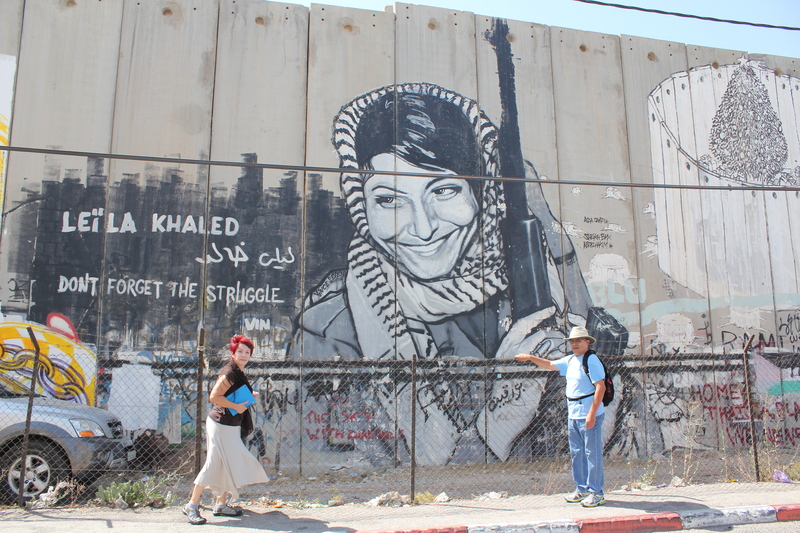 We drove on the Jericho Road 90 on the Green line; which is used by both Israelis and Palestinians. 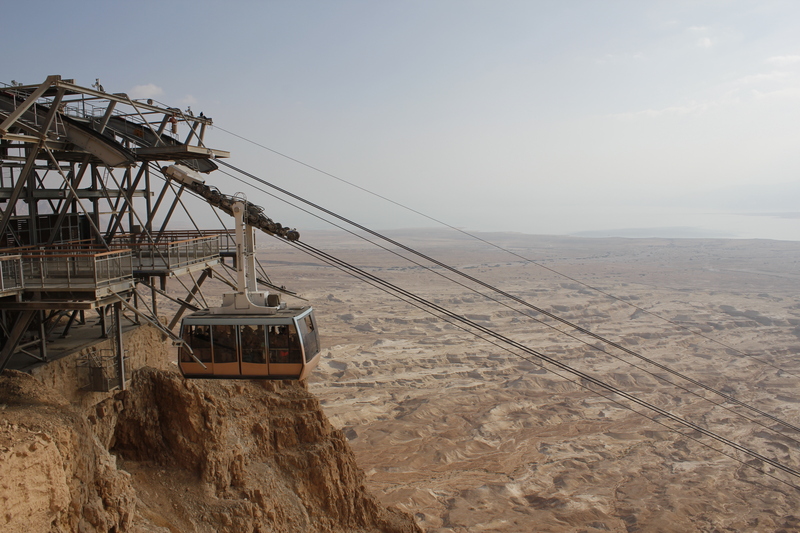 We saw the magnificent Judean dessert where Jesus made his long and arduous walk for 40 days and 40 nights. The temptation mount where Jesus and the Apostles were tempted by the devil. 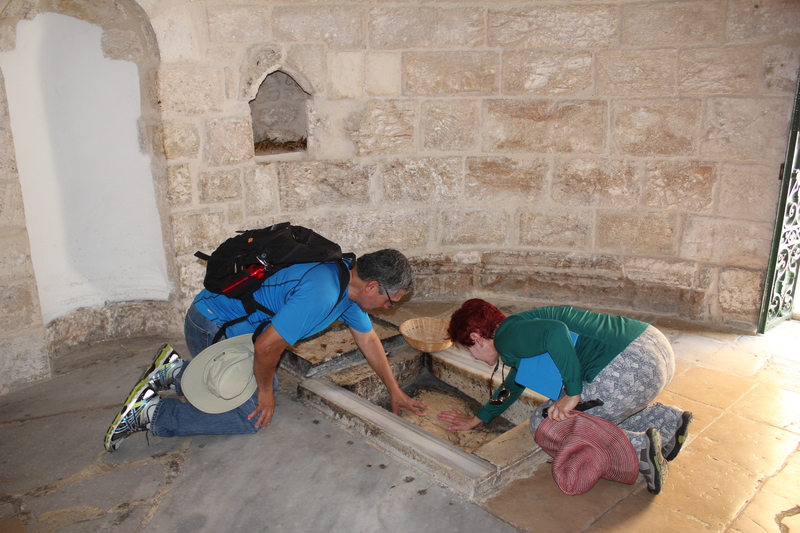 We also visited the place where John Baptiste baptized Jesus in the Jordan River. We ended the day with perfects views at night of Jerusalem from the top of Mount of Olives as Wally joined some of his cousins (he says he has 32,o00 cousins) for their traditional daily summer BBQ. We were offered some whisky and were invited to eat with them after our return from the Dead Sea (but we never met them again). Wally also helped us book a room at the hotel on top of the Mount to enjoy the perfect city views on our last night in Jerusalem. a little whisky to celebrate with Wally’s cousins. View of Church of Nations from the other side of the avenue. We traveled to Ein Gedi on the Dead Sea. We stayed at the hostel, one of two overnight places in the entire area. We were met by one of Wally’s 32,000 cousins, Mike. He was the perfect host and took care of us during our entire stay there. He drove us to the private beach for the mud rub treatment, a swim (or float) on the Dead Sea and a massage at the spa. One of my many birthday gifts from mom and Alberto :). It was incredible to feel such dense water full of minerals., being in the water felt like someone was holding you up to help you stay afloat. I got some water in my mouth and it was super salty, yuk! The next morning I got up at 4:00 am to hike up to Masada to see the sunrise. 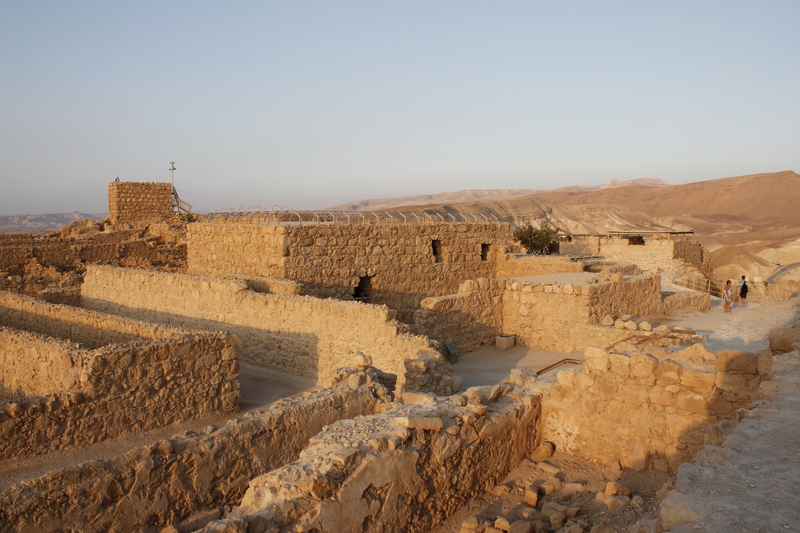 This is where you find the ruins of Masada, a desert fortress built by Herod the Great on top of a majestic rocky plateau. This is the a Unesco World Heritage site of the Jews’ last stand against the Romans after the fall of Jerusalem. Mike graciously offered a ride as no buses run this early in the day. 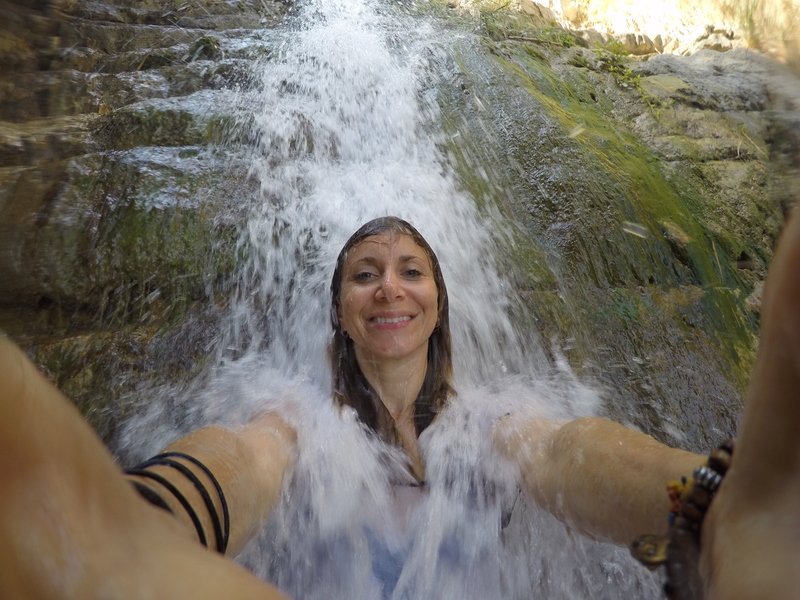 We spent the afternoon enjoying the fresh waterfalls in the Ein Gedi Nature Reserve, a perfect oasis in the middle of this crazy hot and dry dessert. But we still could not get enough of the Dead Sea so we went back for a second float at sunset. Enjoying the fresh water at the Nature Reserve. It is sooo hot and dry in the dessert that this was definitely a welcoming oasis! 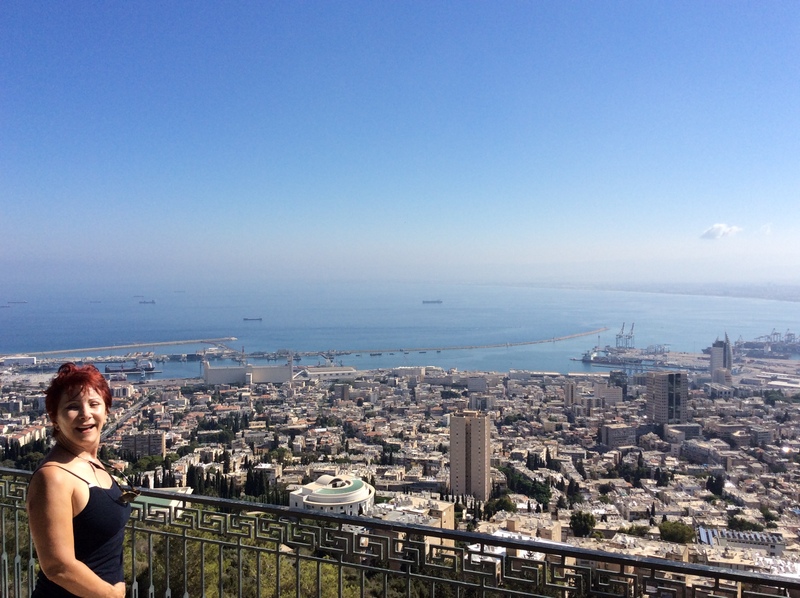 We visited Haifa in Northern Israel, a beautiful port city in the Mediterranean and the third largest city in the country. We stayed at the Port Inn, a beautiful and quaint guesthouse by the German colony, ran by a group of a very nice ladies who are very helpful and eager to teach you about their city. 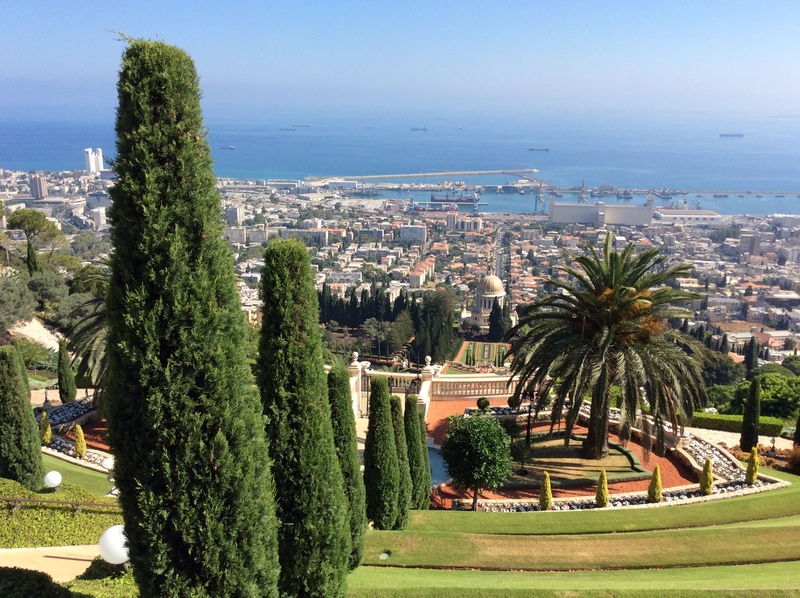 Haifa is home to the Bahai world center with its famous garden terraces on Mt Carmel, another Unesco World Heritage Site. According to wikipedia: the Bahai believe in the unity of God, that there is only one God who is the source of all creation; the unity of religion, that all major religions have the same spiritual source and come from the same God; and the unity of humanity, that all humans have been created equal, coupled with the unity of diversity, that diversity of race and culture are seen as worthy of appreciation and acceptance. Sounds pretty good! 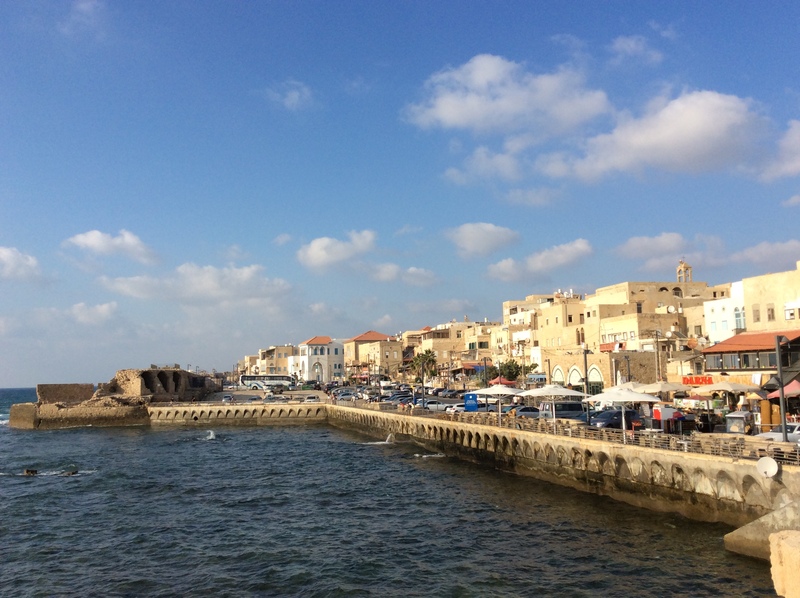 We took a side trip to Acre (aka Akko), one of the oldest cities in the world dating back to 1400 BC. It used to be a leading port in the Middle East like Alexandria and Constantinople but now it is mostly a fishing village. We saw some incredible ruins and the Templar tunnels of the Crusader times of 1104 AD. The Templars were a military-monastic group that escorted/aided pilgrims that wanted to visit the Holy lands of Israel. 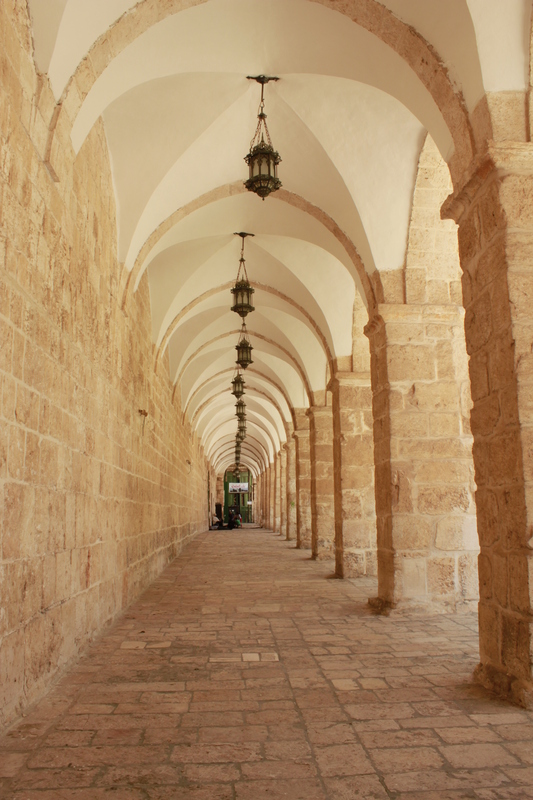 They first settled in the Temple Mount (hence their name) and later moved to Acre. The tunnel was connected to a Fortress. We watched these kids jump off the fortress walls into the ocean… about 15 m high. 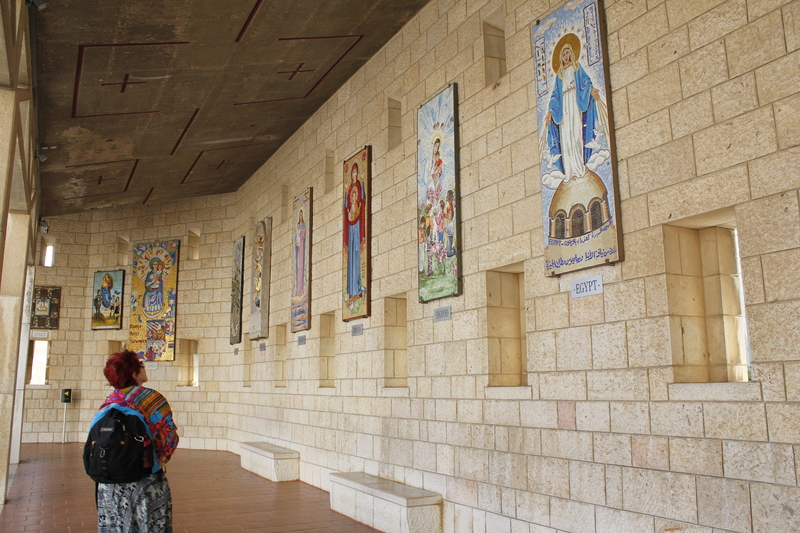 The following day we took a bus to Nazareth, an afternoon stop on our way to Tiberias. We found a nice restaurant where they stored our bags for the day while we visited the Basilica of the Annunciation, where archangel Gabriel advised Mary of her faith. It is by far the most beautiful church I have ever seen. 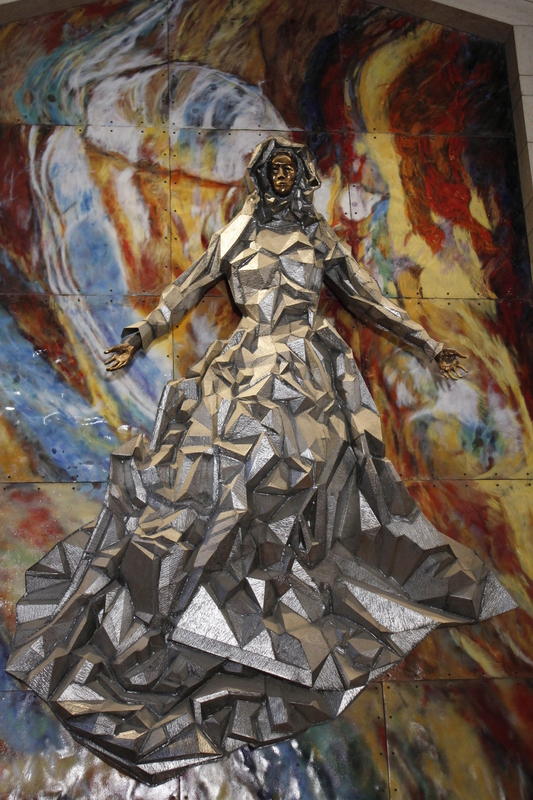 It was like museum full of big paintings, wood carvings and mosaics donated by churches of different Catholic countries from around the world. We also visited St Joseph’s church where his carpenter shop was; which had sculptures of Jesus’ early years in Nazareth and Galilea. 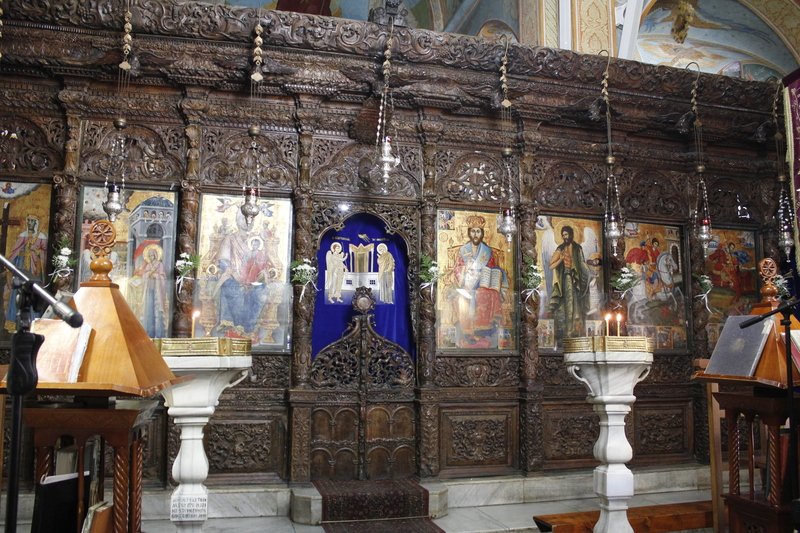 We also saw the Greek orthodox church where they believe the annunciation took place, filled with beautiful frescoes in the ceiling and works of art all around. After our regular gelato time, we waited an hour for bus 431 to take us to Tiberias. Waiting for the bus from Nazareth to Tiberias; which was an hour late. Alberto is not very happy. Tiberias is located on the western shore of the Sea of Galilee. We stocked up on potato chips thinking we had to get ready for the Sabbath after people told us that every store and restaurant would be closed from sunset on Friday until Saturday. We quickly found out that the Arab restaurants by the sea stay open during that time. Alberto and mom enjoyed more of the Biblical sites around Tiberias and the Sea of Galilee while I stayed in the hotel and did absolutely nothing but lay around and apply for my electronic visa to India. For me it was time to take a break and enjoy my surroundings. I was exhausted after the relentless sight-seeing. I truly felt like an old woman and could not go on anymore. I really don’t know where Alberto and mom get their energy from… but to my defense, they have not been traveling almost four months in a row like me. We took an evening flight to Eilat, border city with Jordan on the Red Sea. This would be our last stop in Israel before crossing the border to go see Petra. View of Eilat from our hotel. It looked like the Vegas of Israel with nice looking hotels and restaurant/bars everywhere. I met you the other day at the Trip4Tip in Jaffa. You told me about your blog and I signed up for the newsletter. So nice that you can enjoy your life at this time of life. 40 years! wow. I’m younger, and still I’m jealous of your courage to do so. Keep going, meet the bright side of life and the good people in it. I love to read your travel journal. It’s super interesting and I learn a lot of interesting facts. Your photos are amazing as well.